If you are organizing an event for your department, working group, or various other occasions, you might be interested in using the video recording services provided by the IT department at the GC. 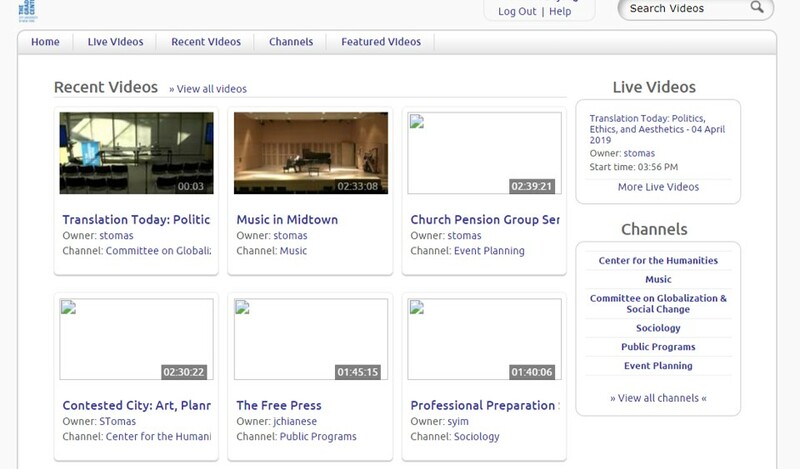 This blog post illustrates how to request the livestreaming and recording services for events that take place at the GC. It also gives some useful tips when publicly sharing the recorded videos online. Fill out this simple IT Media Services Form 3-5 business days prior to the event. Note that you need to provide the name of a person who will oversee the recording. This can be the EO, director, or chair of department or organization. 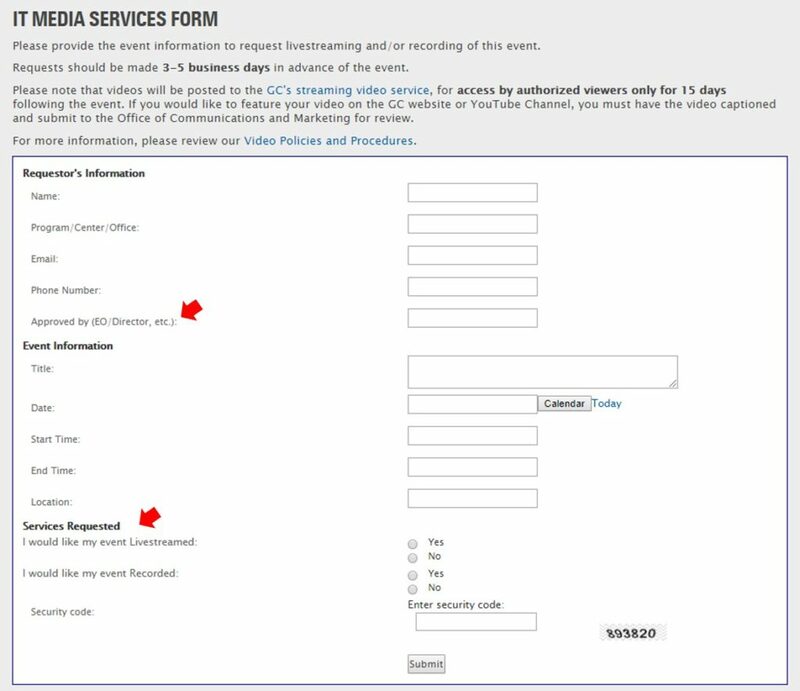 When filling out the form, select if you want your event to be livestreamed and/or recorded. *Remember! If you choose to have your event livestreamed, make sure you have active plans to share the livestream link (sent from the IT) with your potential audience via email listserv or social media. Here are some great tips on how to better promote your livestream. Once you submit the form, you will receive an email confirmation from the IT department. Make sure the date, time, and requested service options are correct. On the day of your event, IT will set up the video stand a couple hours before the event. Note that IT will not be present during the event to record the video. Most likely, you will be responsible for pressing the start and end button, so make sure to read the written instructions attached to the stand on how to start/end the recording. Once the recording is finished, you will have 15 days to access the recorded video from the GC’s Streaming Video Service. You need your GC ID and password to log in to the website. Only the person who requested the video service can download the video. Since the recorded video is accessible for only a limited time, quickly download and save it in a safe place. To download, first select your video from the home page and then click the “download video” button on the bottom right. There are two quality (high and low) versions of the recorded video. Choose the one that suits your need. If your video is long, the high-quality version may have more than one file. 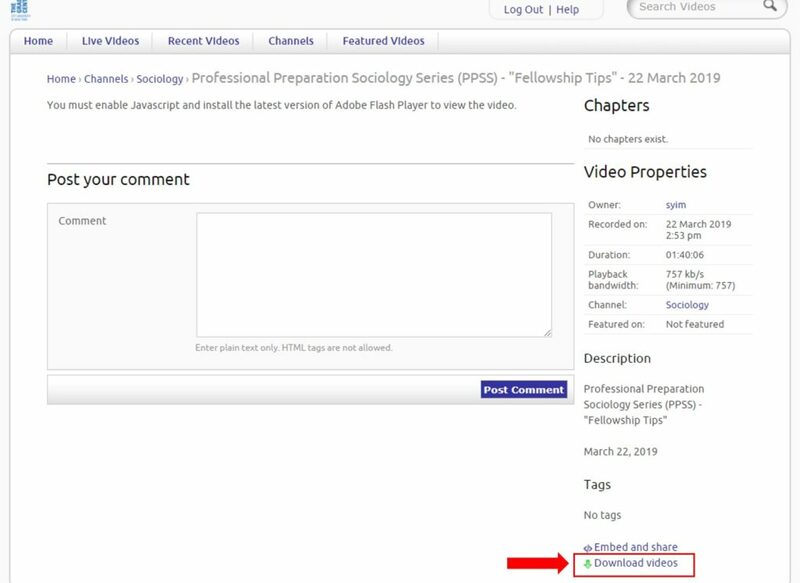 To upload and share the video on the official GC website or YouTube Channel, you must have the video captioned and submit it to the Office of Communications and Marketing for review. Find the detailed guidelines HERE on important policies and procedures about sharing videos online. Learn more about some video captioning tools and how to add captions to videos for various social media platforms. 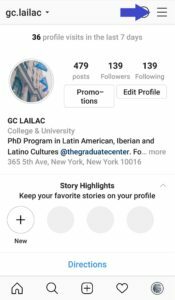 As Program Social Media Fellows, one of our goals is to advocate for the use of social media as an academic medium to foster community and scholarly discourse. We strive to demonstrate how social media can be used to share information about recent publications and upcoming events. But how can we portray the significance of this medium to those who are skeptical about its benefits? How can we respond to those who tell us social media is just going to eat away at time they don’t even have or that it lacks academic gravitas? Rather than simply pleading for the creation of Twitter accounts, how can we communicate the benefits of social media and debunk some of the stigma surrounding it? As an Educational Psychology PhD student who is interested in digital technology as a context for child development and how digital mediums such as video games can promote learning, I have been thinking about how my research can inform the use of social media within an academic environment. Can we combat some of the bias and skepticism surrounding social media by looking to research on the relationship between digital technology use and learning or well-being? Would making this connection allow us to create a value-based model for effective social media use within an academic context? 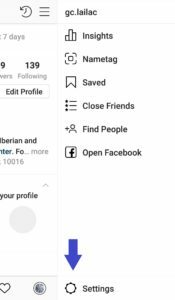 This week, Instagramers noticed a new tool on the digital platform. 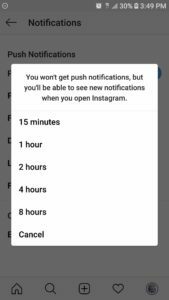 Instagram now offers its users the opportunity to press pause on all notifications for a set amount of time. With this update, any user can stop receiving push notifications for 15 minutes, 1 hour, 2 hours, 4 hours, or 8 hours. This way, constant updates on posts, stories, messages, etc. do not appear on your screen, unless you decide to open the Instagram app directly on your phone. Therefore, when you have an important task at hand or when you simply want to enjoy time away from the screen, you can now choose to reduce the amount of interaction that you have with the platform. This, indeed, brings an important topic to mind: our social addiction to screen time. Last year, Social Media Today published an article addressing the question of How Much Time Do People Spend on Social Media? Unsurprisingly for some, on average “teens now spend up to nine hours a day on social platforms” while “the average person will spend nearly two hours on social media everyday, which translates to a total of 5 years and 4 months spent over a lifetime.” Overstimulation, sleep disruption, online harassment, and poor concentration are only some of the effects associated with heavy use of Social Media. Everytime we choose to enter the world of Social Media we are exposed to these factors- the longer we stay on, the greater the risk. As a doctoral student, I know plenty of peers who choose to deactivate their accounts to focus on their work. Others, feel the need to turn off their phones altogether when heavily immersed in their research. Thus, it is promising to see social media platforms recognize the need to disconnect, if only momentarily. It is true that, while many phones have allowed users to block notifications from a particular application, not many allow one to simply pause these, and recommence them at a later time. 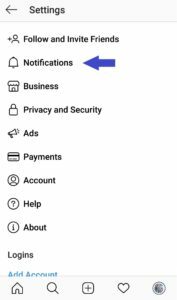 Also, certain applications allow the user to mute notifications, yet these are usually messaging apps, such as WhatsApp and Messenger. This option is especially useful at times when the conversation does not involve the user or when the user is not interested in what is being said. 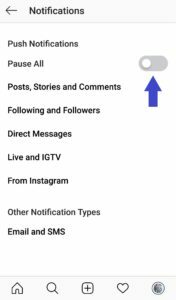 Yet, for a social media platform like Instagram, whose main goal is to grasp the public’s attention through an endless amount of photos and videos, the motive for offering a pause option seems to speak to different needs. By allowing users to pause their interaction with the platforms, these may not only promote a healthy life for their uses but even put their own interests aside. Instead of focusing on providing a data gold mine for companies, they seem to be making a greater effort at providing functional and convenient services to its users when needed. We can, as a result, access Social Media at a set time and, perhaps, take advantage of the helpful features offered by the platform, instead of wastefully navigating for hours its sometimes turbulent, never-ending, and mind-numbing content. Keeping conversations civil, active and engaging on social media could be challenging. As Social Mediums, we discuss at length how to keep conversations healthy and how to deal with trolls. Until now Twitter provided three options to this matter: block, mute, or report, but none of them completely addressed the issue. The first two only affect the experience of the blocker, and ‘report’ only works for the content that violates Twitter policies. But all this is about to change as Twitter is working on a new feature that will let users the ability to hide replies to their tweets, giving them more ways to control what is seen in their feeds.